Children and lunatics cut the Gordian knot, which the poet spends his life patiently trying to untie. I wanted to discuss the suffering of humanity in general, but perhaps we'd better confine ourselves to the sufferings of children. Maturity is to recover the seriousness of a child at play. The genius of art finds sanctuary among children and madmen to survive.That is who we are. It is she, the little girl, dead behind the rosebushes. The young mamma, deceased, comes down the stoop..
...and the blood of children ran through the streets without fuss, like children's blood. Wie Kirschen und Beeren schmecken, muss man Kinder und Sperlinge fragen. drang in den Tannenrumpf das grüne Wasser ein..
Lächelnd das krank ist hält er seinen Schlummer. Natur umhüll ihn warm! es friert ihn noch. Ihm zuckt die Nase nicht vom duftigen Wind. Brust - auf der rechten ist ein rotes Loch. (DER SCHLÄFER IM TAL, Übersetzung: Stefan George). o wieg ihn warm Natur, ihn friert so heute . . .
er hat zwei rote Löcher in der Seite. (“Tod und Leben, (Frühlings Erwachen; 3. Akt, 7. Szene). Du starbst, von einem Strom fortgerissen, Kind! Ich – das ist die Kind­heit. and now it's final: one more child." Each second we live is a new and unique moment of the universe, a moment that will never be again. And what do we teach our children? We teach them that two and two make four, and that Paris is the capital of France. When will we also teach them what they are? We should say to each of them: Do you know what you are? You are a marvel. You are unique. In all the years that have passed, there has never been another child like you. Your legs, your arms, your clever fingers, the way you move. You may become a Shakespeare, a Michelangelo, a Beethoven. You have the capacity for anything. Yes, you are a marvel. And when you grow up, can you then harm another who is, like you, a marvel? You must work, we must all work, to make the world worthy of its children. From the moment of my birth, the angels of anxiety, worry, and death stood at my side, followed me out when I played, followed me in the sun of springtime and in the glories of summer. They stood at my side in the evening when I closed my eyes, and intimidated me with death, hell, and eternal damnation. And I would often wake up at night and stare widely into the room: Am I in Hell? When I was as old as these children, I could draw like Raphael, but it took me a lifetime to learn to draw like them. I don’t know why, but since my early childhood I was obsessed with the idea of justice. When I learned what people of my country did to innocent people during the Nazi-regime, and how mass-murderers got away after the war and made big careers – everything stopped for me right there. I lost my trust in the world of grown-ups and their system of values. In a child the full potential of humane values and virtues, of innocence, trust, love, compassion and creativity is intact. Children are sacred. But they are vulnerable and defenceless and depending on our fairness. And it seems that adults tend to betray that trust. In the sixties, long before mass media ever mentioned child-abuse in Germany, in my research into that subject, I saw hundreds of police-photographs of dead children’s bodies, fragile, skinny, broken and sometimes deformed beyond recognition; tortured to death – often by their own relatives. These pictures travel now with me and I can’t get rid of them. My work is about the struggle of human existence and children are the heroes of my visual narratives. Is this frighteningly precocious child not fated to bestow the consecration of a masterpiece on the negative sense of living, the illness from which he more than anyone else seems to be suffering? Helnwein is a great believer in the ability of art to pass emotional memory on, as a reminder of the past or mainly as a warning of what the future might hold, for humanity, as far as he is concerned, has not learnt its lesson. Is there atonement in his artistic endeavors? I prefer the Jewish concept of “tikkun”, purification of the soul. It has a deeper meaning than the physical healing of scars, for it elevates us to the highest sphere of the spirit. The wounded girls close their eyes, but they are not blind. Behind their closed lids their gaze is clear and penetrating. I'll never forget the sensation I had at the unveiling of Gottfried Helnwein's "Head of a Child" in the Russian Museum. And not just because this enormous canvas (six metres in height, four in breadth), well-known from reproductions, seemed to operate in a whole new way in the real, quasi-monumental space of the museum's exhibition-hall, - I realised that I was looking at the inner content of this innovative picture from a whole new point of view. I always feel so much more comfortable communicating with children than with grown-ups. Everything is far more simple and makes so much more sense – to me at least. In the world of a child anything is possible, there are no limits for imagination, and magic and miracles are a natural part of life. Communicating with adults, on the other hand, sometimes seems to be so limited and incredibly complicated. And usually boring. Unfortunately it’s the grown-ups that rule the world and make the laws and all kids have to go through their demolition-program called education. Once they come out on the other side they are usually broken, and their magic is gone. And then they can be citizens, soldiers, clerks, psychiatrists, politicians, bankers, undercover agents, prostitutes or other interesting things like that. Genius is childhood recovered at will. O innocence! innocence, innocence, innoc..., plague! I needed to purge myself of all the attention my parents had given me - I wasn't neglected enough as a child. The Voice of the child is in all my work. Critics used to say that I am the child in my plays. I don't think one has to be so literal, but for me it makes the work believable. I think it is necessary that we se the child and his point of view at all times. An alternative title to "Angels Sleeping" for this exhibition could be "All Hail to the Wounded Child," as many of the works center on irreparably wounded children (both externally and internally) as the innocent victims of war. The children in Helnwein’s works may also represent the lost or destroyed child in all of us, not only as victims of war, but as victims of modern society, with all its mindless violence and perverse attraction to aggressive mobs and disturbances. If there were a soundtrack to this exhibition, it would be a long, endless scream. about the Gottfried Helnwein exhibition "Angels Sleeping"
Helnwein is the next generation’s final ally, a skilled provocateur forcing us to confront the legacy we have bequeathed upon our children. Helnwein is our chronicler, our conscience, the antidote to our failing memories. He refuses to let us forget. Das Bild des Menschen in der Leidensnot, des unschuldig Verfolgten und Gequälten, das aus der Kunstgeschichte in zahllosen Märtyererszenen bekannt ist, entsteht immer wieder neu. 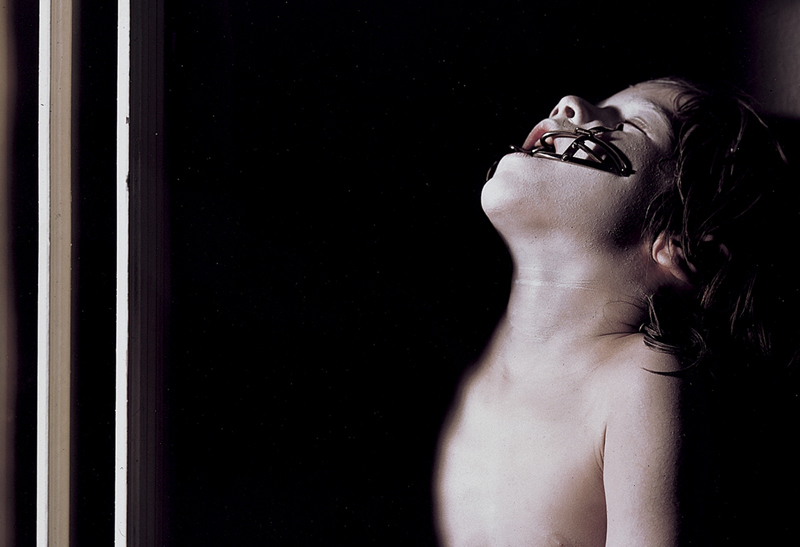 In den Bildern von Gottfried Helnwein ist Betroffenheit über Schmerz und Ausweglosigkeit in der Situation des Kindes dargestellt. Das Kind ist die Gestalt des Unterlegenen, Abhängigen, Ausgelieferten und Ausgenützten. Unter dem Druck einer auf Anpassung drängenden Erwachsenenwelt werden ihm tiefe Verletzungen eingeprägt, entstellende Traumata. Die Bandagen bei Helnwein oder schon zuvor bei den Wiener Aktionisten (Schwarzkoglers Bandagenaktionen) verweisen sowohl auf die Entstellung des Körpers wie auf das Verborgene dieser Verletzungen. Sie üben auf dem Hintergrund einer Tabuisierung von Verwundung, Behindertenexistenz und Tod eine starke Wirkung aus und setzen heftige Reaktionen frei. Adults bring a trunkful of contradictory cultural baggage to any representations of children. That's what makes the work of Helnwein so powerful. In his show, "The Child," at the San Francisco Fine Arts Museum, deformed infants and bandaged children stir feelings of pity, defiance and uneasiness about exploitation. There's an ambiguously disturbing painting of a girl aiming a gun into an open refrigerator and another of a bare-breasted mother and child surrounded by Aryan soldiers. But the most haunting images may be the ones of children who seem strangely oblivious to the adult gaze. Some of Helnwein's children peer right past the onlooker. Others sleep, dreaming of anything but us behind their silky eyelids. And some, like the enormous, half- shadowed "Head of a Child" see straight through us with cloudless, infinite blue eyes. I feel there is a strong bond between artists and children and all other sacred fools. At his daily bus stop, he recognises a face he has seen in photographs, under a black cap with skull insignia and above a black SS uniform. They boy blackmails the unidentified murderer to tell HOW DID YOU DO THOSE THINGS. The murderer tells to save his life. Curiosity becomes the urge for real experience: the two of them found Murder Inc. and rid the small town of dogs, tramps, and other "unworthy life". ... How does a friendly person like Helnwein stand making his - excellent - painting into a mirror of the terrors of this century? Or is it that he can't stand not doing it? Does his mirror just reflect the attitude of the century? TERROR WITHOUT END IS BETTER THAN AN ENDING IN TERROR. It comes from the over-evaluation of death, a consequence of "statistics" making it taboo. Perseus guillotines the Gorgon in the mirror -, and when the head falls, it is his own. How many heads does a person/man have in our age of mirrors? Scale is an important part of his strategy because, he wants to engage with the widest possible public. To this end, transgression is also central. An extremely impressive work "Selection", made in 1988, consisted of a series of uniform, huge images of children's faces, stretching from Cologne's Ludwig Museum to its cathedral. The subtitle, (Ninth November Night), gave the clue to the event the work marked - the start of the Holocaust on Reichskristallnacht, November 9, 1938. In presenting people with a series of entirely neutral, if rather beautiful, pictures of innocence and implicitly pointing out that just such innocents were sorted and selected for extermination, Helnwein was resurrecting an aspect of the past that most Germans and, perhaps even more so, Austrians, have preferred to forget. It certainly annoyed someone to the extent that they came and vandalised it, symbolically cutting the throats of some of the images. Selection shares with Helnwein's more sensational work a desire to prod us into thought about our own attitudes and roles. The real horror, as his work reiterates, is indifference and complacency.